She sat back in her seat, letting the wind blow her long brown hair while she closed her eyes and took in the salty air. She exhaled slowly, allowing everything from inside of her to be released - all the stress, the negativity, and the worry she had carried this week. Her eyes slowly opened, turned her head to the right, and watched as the surfers had their fun. She smiled, thinking back to the time she shared with high school friends. HB was a popular destination for them but then again, with a curfew of 8PM, she couldn't go too far anyways. Ah, the good old days where bills were nonexistent and responsibilities were a myth. Oh to be young again. "We're here," he said. Putting the car in park as the valet guy opened her door. It was time to indulge in the beach and the sea, the only place that makes her happier than he. Imagine falling asleep to the sound of the waves crashing, only to wake up refreshed with a hot cup of coffee in hand while you gaze at the ocean from across your balcony. If you're ever in need of a stress reliever or want to stay at one of the best Huntington Beach hotels, I highly suggest Shorebreak Hotel. From the giant Chess set to the complimentary wine, you won't have a hard time finding something to do here. 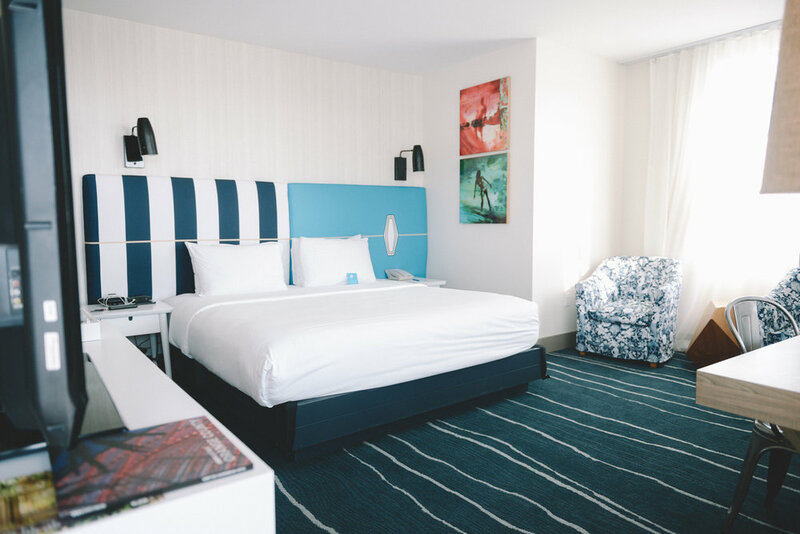 Located right across the pier is Shorebreak, a Kimpton hotel. It is the closest hotel in the world to Huntington Beach, with the sand just about 100 feet away. This is the perfect place for summer through early winter because let's be real, summer doesn't really end in SoCal. After checking in, go back downstairs to grab your complimentary glass of wine. From 5PM to 6PM everyday, you can un-wine any way you like. Enjoy the great weather with their outdoor lounge, play human sized Chess, and challenge your friends to ping pong. If you're looking for something sweet, grab a DIY s'mores kit and start roasting around the fire pits. *Check daily schedule for activities and events. Don't feel like going out? Grab a seat at Pacific Hideaway or order in. You know I love my room service but the decor at this restaurant certainly made me want to enjoy the vibes. With indoor and outdoor seating available, and a full stocked bar, you certainly can settle in on your first night with ease. *Click here for happy hours and dining times. I can't help but feel spoiled when it came to our room because the ocean view was beyond gorgeous. I wanted to stay out on our balcony the entire time, just watching the waves. Not to mention the balcony is extremely spacious and I loved the privacy we received. Just for reference, the beds are as comfy as they look and I tested it out by jumping around on it - hah. With the decor as calming as the sea, our room was one of the cutest that I've stayed in and matches the vibes of HB. From the moment we checked-in at the front desk to the time we left, we felt nothing but warm and heartfelt vibes during our stay. The staff here is extremely accommodating and are the sweetest people I've ever met. You don't hear me raving about customer service too often, so for me to mention it means a lot. Thank you Shorebreak for having us and we will certainly be back!